The BlizzCon 2017 opening ceremony was home to the announcement of a new Overwatch hero: Moira. She's a support healer with a great deal of utility and mobility. Moira will be coming to test servers very soon. "Moira’s biotic abilities enable her to contribute healing or damage in any crisis. While Biotic Grasp gives Moira short-range options, her Biotic Orbs contribute longer-range, hands-off damage and healing; she can also Fade to escape groups or remain close to allies in need of support. Once she’s charged Coalescence, Moira can save multiple allies from elimination at once or finish off weakened enemies." Biotic Grasp - Using her left hand, Moira expends biotic energy to heal allies in front of her. Her right hand fires a long-range beam weapon that saps enemies’ health, healing Moira and replenishing her biotic energy. Biotic Orb - Moira launches a rebounding biotic sphere; she can choose between a regeneration effect that heals the allies it passes through, or a decay effect that deals damage to enemies. Fade - Moira quickly teleports a short distance. 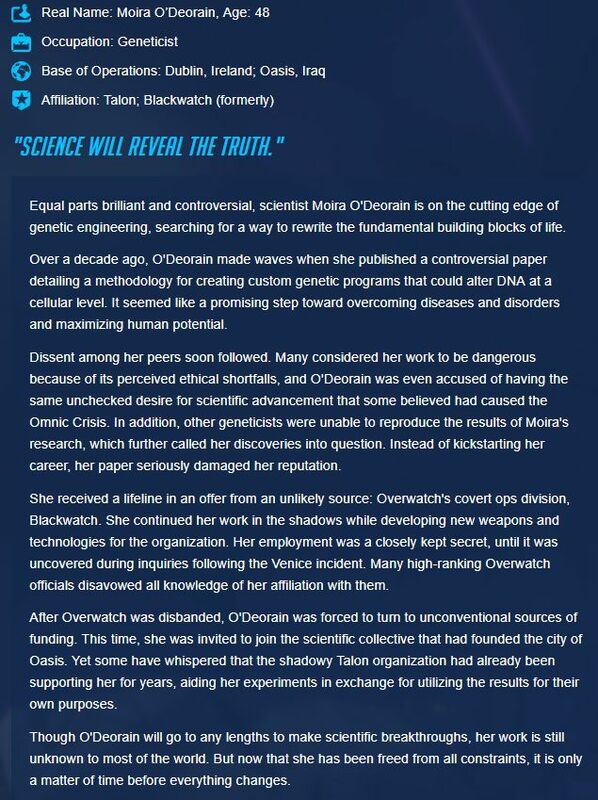 Coalescence - Moira channels a long-range beam that both heals allies and bypasses barriers to damage her enemies. All virtual ticket holders for BlizzCon 2017 will receive a collection of rewards for Blizzard titles, including a Winston skin.